Walk to small sandy beach on Flax Pond, just 2 blocks away! 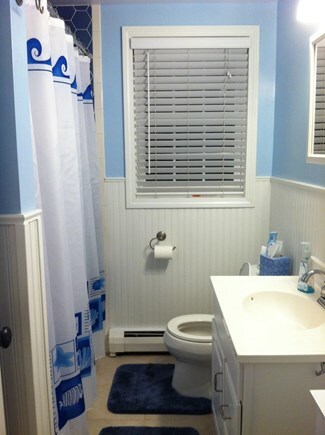 Great Dennis location near Flax Pond, Route 6A, and Mayflower Beach. Large fully fenced back yard that is pet and child friendly. The home offers two floors of living space. The 1st floor has a living room with a flat panel TV, a fully equipped eat-in kitchen, sliders to the deck, a full bathroom with tub, and two spacious bedrooms. The master bedroom has 1 queen bed, an armoire, dresser, closet with built in shelves and drawers, and TV. 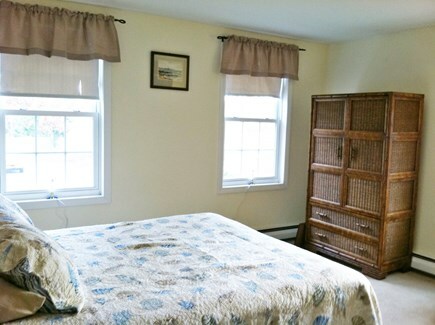 The twin bedroom has two twin beds, a dresser, a closet with built in shelves and drawers. 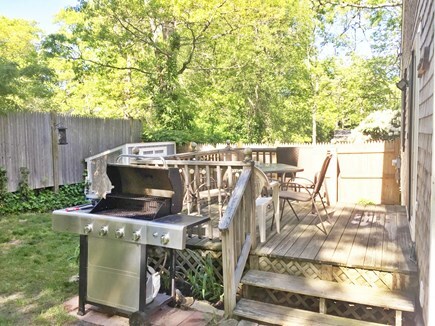 Fully fenced yard with deck, outdoor table with seating for four, grill, large outdoor shower with changing area and extra long shower head to rinse feet and pets, and fire pit area with chairs. There is a shed with beach chairs, beach umbrellas, and yard games. 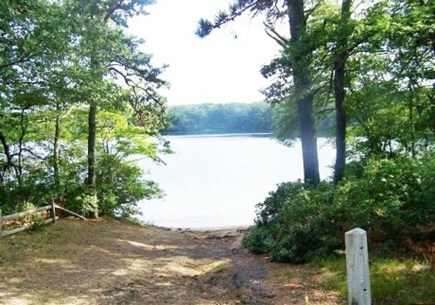 Deeded rights to Flax Pond where you can kayak, swim or hike. Small, family friendly sandy beach at Flax Pond. This is a pet friendly rental. Additional pricing info: $150 per night Sunday through Thursday, $175 per night Friday and Saturday night. 3 night minimum, State and local taxes of 12.45% will apply. We just stayed at Sandy Paws for the 4th time, and it's still one of our favorite places ever! The perfect amount of space for a family of 4 -- the backyard, deck, and outdoor shower are delightful. Carrie is so responsive and helpful. And Dennis is just the most delightful place on the Cape! This was our second time renting from Carrie and Larry, and I'd have to say that I would do it again. Sandy Paws is always clean and welcoming of our dog, Guinness, who loved the fenced in backyard as did the kids. The location is great and quiet. As others have mentioned, we were able to get in earlier than expected, and Carrie was just a quick text away from answering our question/concerns. I highly recommend renting this property. My family and I have been staying at Sandy Paws for the past 3 years and hope to stay many years to come. The home is very clean, quaint, and my children and fur baby love it here. Very pet friendly, has a wonderful fenced back yard that your dog will love. I have been vacationing in Dennis for over 30 years and finding Sandy Paws has been wonderful. Owners are fantastic to work with also. Highly recommend to anyone. Plenty of room inside and out, has all the amenities needed. Owner super-responsive to inquiries emailed or texted. 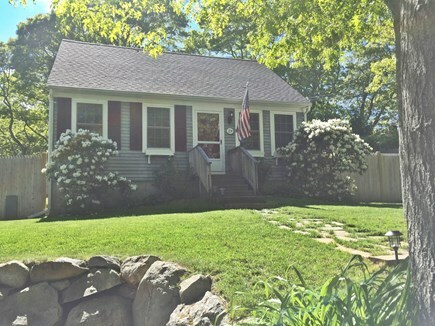 Close to great beaches and restaurants, nice central location on the Cape. We did not have to pack beach chairs or toys, condiments, hand towels, etc. so lots more room in the car for the dogs. Highly recommend for families with young children - safe fenced-in back yard. This house was more than expected , our family thoroughly enjoyed themselves . Carrie is so nice and she made the booking process so easy, quick to respond to e-mails or messages . we spent a week here , this house exceeded our expectations - there was more than enough room for everyone , it was so nice to have a fenced in yard ( esp with kids ) . We were in the center of everything it seemed- we traveled to Boston , provincetown and went to Martha's Vineyard as well, the house seemed to kind of be a mid point for all , which was nice . Overall was an excellent time had by all !! We hope to be back to visit !!! Thanks again for a wonderful family vacation !! This was our 3rd time staying at Sandy Paws and it's started to really feel like our home away from home. Everything is comfy and low-key, and perfect for our 2 young kids. 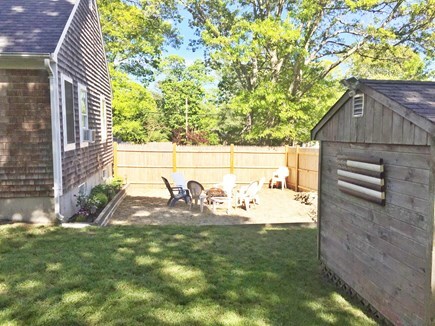 The fenced-in backyard and deck are great places to relax and play, and we all love the short walk to the Flax Pond -- the kids might like swimming there even more than the ocean beaches! The amenities like the outside shower, laundry, and BBQ make family vacation that much easier. Plus, though we've also stayed in Wellfleet and Eastham, Dennis is by far our favorite place to stay in the Cape. We love this place!! This was my second time staying here. Not only is this house in my favorite part of the cape but only about a 5 minute drive from my favorite beach. The owners are great too! My toddler loved that it's dog friendly and we filled the bird feeder to watch all the birds! We had a great time here and hope to visit again next year! We are frequent visitors to Cape Cod, but this is the first time we have rented a house. The reviews on this property were what initially captured my interest. 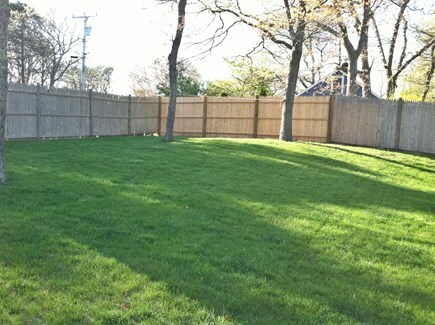 We brought our 2 dogs along and the fenced-in back yard was large - lots of room to chase frisbees and balls. The extras included were great! Plenty of toilet paper, paper towels, condiments in the fridge and some spices. The kitchen is small - but very functional. We dined out on the deck for most meals. 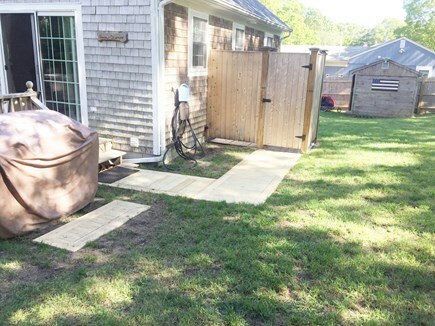 The gas grill and outdoor shower were used frequently. It is truly lovely to shower outdoors on a cool evening under the stars and then sit by the fire pit! Our dogs are swimmers and the pond was great for them - just a long enough walk back to the house for them to dry off. The location is great! The mid-Cape is so convenient to just about everything. We rented bikes to ride the rail trail and went kayaking. Everything is super close. First, Carrie was so prompt with her messages, replies and all correspondence during and prior to our stay at her home which made this process incredibly smooth. Upon arrival we were amazed with the presentation of the house and the spacious, completely fenced in yard and finished basement with bedroom! Our dog thoroughly enjoyed running around the backyard and we were grateful that he could get his energy out safely. Our 1 and a half year old made himself right at home and there were little to no dangers within reach for him. Carrie even had two baby gates that we were able to use to ensure his safety. The home was fully stocked with coffee filters, detergent and even spices! This was probably the best week we could've stayed because after Labor Day there's no fee for parking at the beaches and dogs are allowed on leash! We went to the most beautiful beach on the Cape, Mayflower (a 4 minute drive) every day enjoyed many sunsets. Flax Pond was also a treat for our toddler and dog - a quick walk from the property we just brought some sand toys and he had a ball wading and splashing in the water. We were incredibly impressed with this home and we will definitely be back in the future. 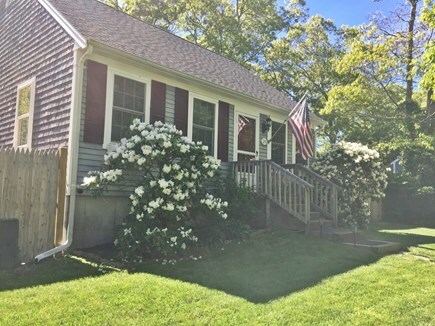 We made some great memories as this was our son's first vacation to the Cape and we couldn't be happier in our choice to rent this house. Thank you Carrie! Hi. Thank you for your interest in renting our home. We have owned our home in Dennis for four years. We met on Cape Cod and have spent many years enjoying Dennis with our two dogs. In 2013, we realized our dream of owning a second home on Cape Cod and are excited to spend as much time as possible on the Cape. 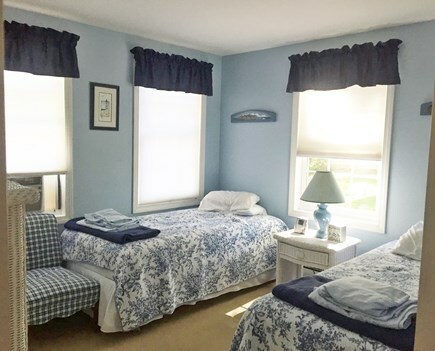 We have spent many years renting on Cape Cod so we have set up our home to provide a comfortable, casual vacation destination that is pet friendly and child friendly. Our home has been a successful rental for the last several years with many of our guests returning every year. We want to share our love of Cape Cod with others. Cape Cod has so much to offer and we are excited to recommend our favorite places to you. Our property is located near the village of Dennis. 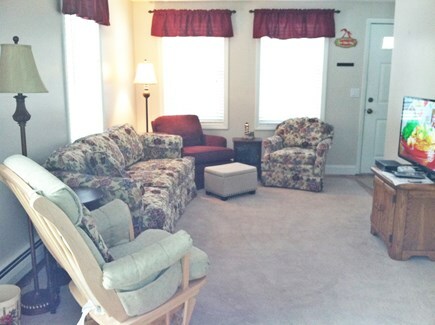 Our home is a comfortable, casual vacation destination that is both pet friendly and child friendly. The yard is fully fenced with a deck, outdoor shower, fire pit area, and a large yard for kids and pets to play. Inside you will find a fully equipped kitchen with a dining table which opens to a comfortable living room. 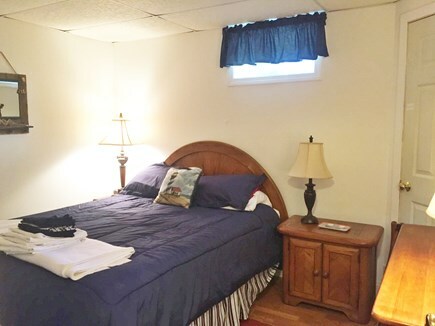 There are two comfortable spacious bedrooms on the first level along with the full bathroom. The lower level provides an additional family living space, another bedroom and a day bed. 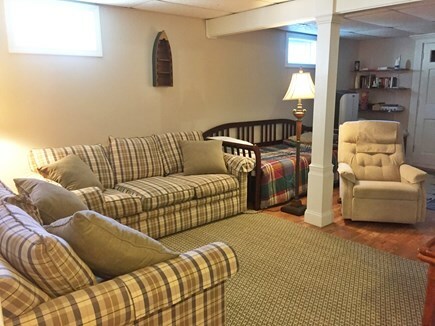 The lower level is perfect for family entertainment space on a post beach afternoon or rainy day. It has a wii game system and flat panel TV. We also have a lending library for your summer beach books, video library, and traditional board games. 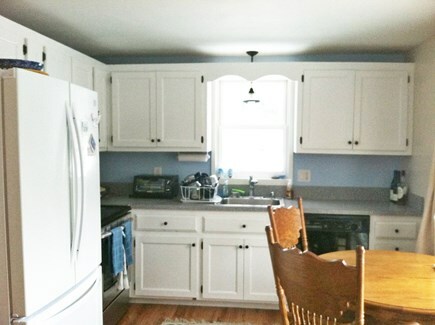 Our house has deeded rights to Flax Pond and it is walking distance from the house. Flax Pond is available for swimming, kayaking, and hiking. There are two main hiking trails around Flax Pond: a 1 mile trail and a 2 mile trail. Popular Mayflower Beach is 1.5 miles away. The house is close to several golf courses. Our favorite being Blue Rock in South Yarmouth which is a par 3 championship course. Selected as one of the top ten par 3 courses by Golf Magazine. The restaurant choices in Dennis and Yarmouth abound. Ask us for recommendations of our favorite Cape Cod spots. Dennis is the quiet side of Cape Cod. Bay side beaches: Mayflower, Corporation, and Sea Street Beaches. The village boasts restaurants and shops. Dennis is located in the mid-Cape.